Hi guys, time for another update. 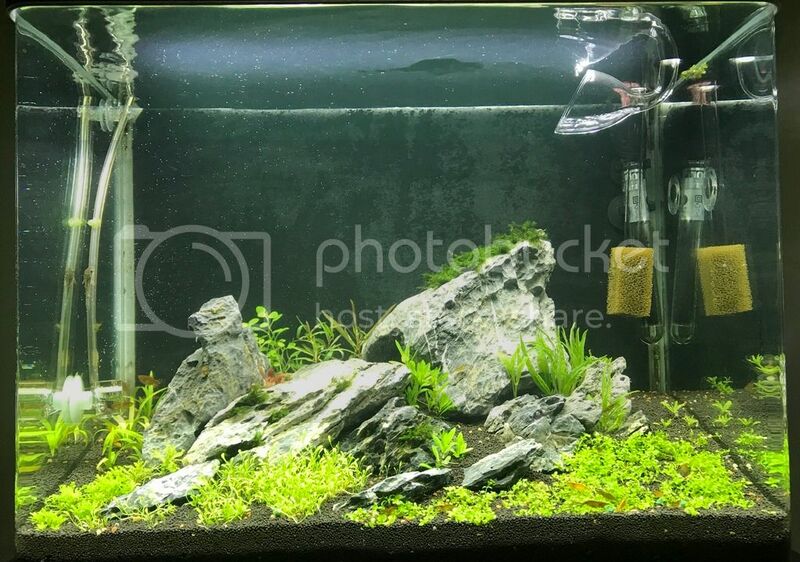 The above scape fell away, algae issues and fish loss, so another scape was done. The next scape was doing good for a while, then a Co2 issue resulting in gassing the fish (while I was away for the weekend!) and another blue green algae outbreak made me pull it down and start again. 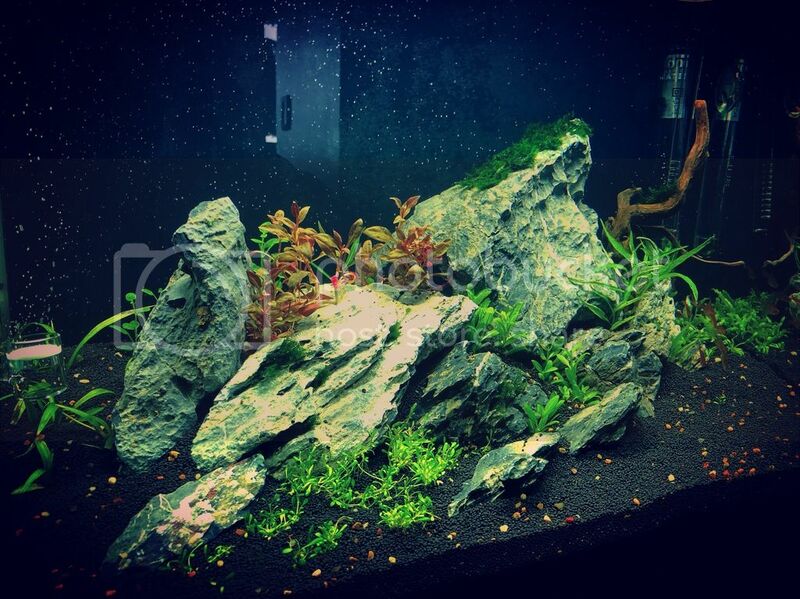 Here’s some shots of the previous scape. The Rams had 2 spawns but no results with fry. The female would just abandon the wrigglers and the male would then be super aggressive to the girl and leave them unattended. 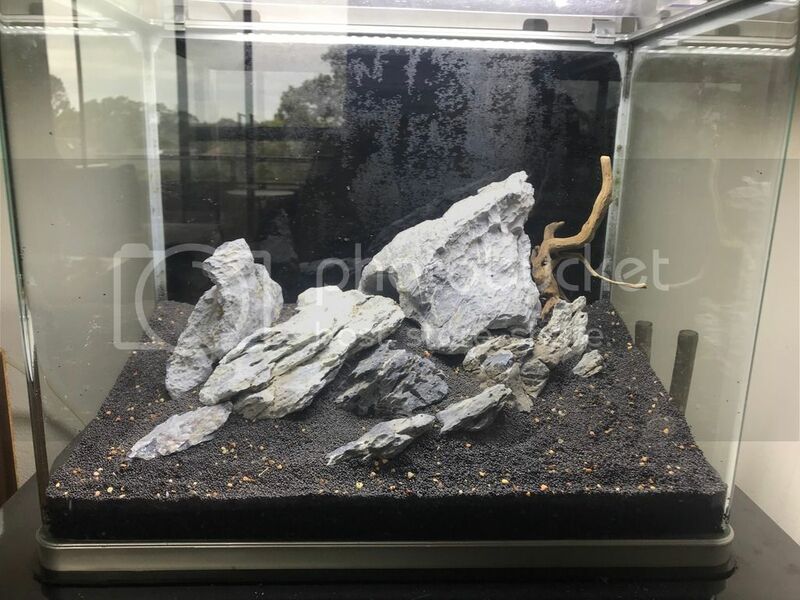 So, the new scape I decided to go with a mostly rock design. I always use wood so I thought it about time for a change. I got some Seiryu stones and a couple of cups of TC plants and then got underway with a design. I had a few plants left over that I cleaned and trimmed, so those got a start in the new setup also. Here’s a few pics of the new scape. Today I got a cup of Micranthemum Tweediei for the front right corner, I’ll plant that later this arvo. Hope you like the new scape,guys. And suggestions of fish would be welcome. Great to hear you are still chugging along. I really like the latest rock scape but wondered why you have a bit of wood in the back? Seems like that piece hasn't been committed to the scape. 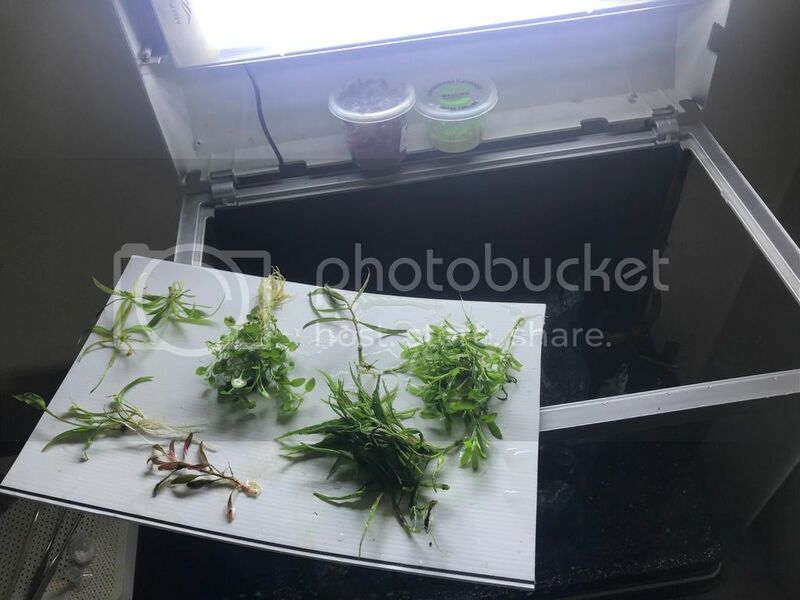 You may find the tetras to be uncomfortable in an iwagumi because there is no place to hide. 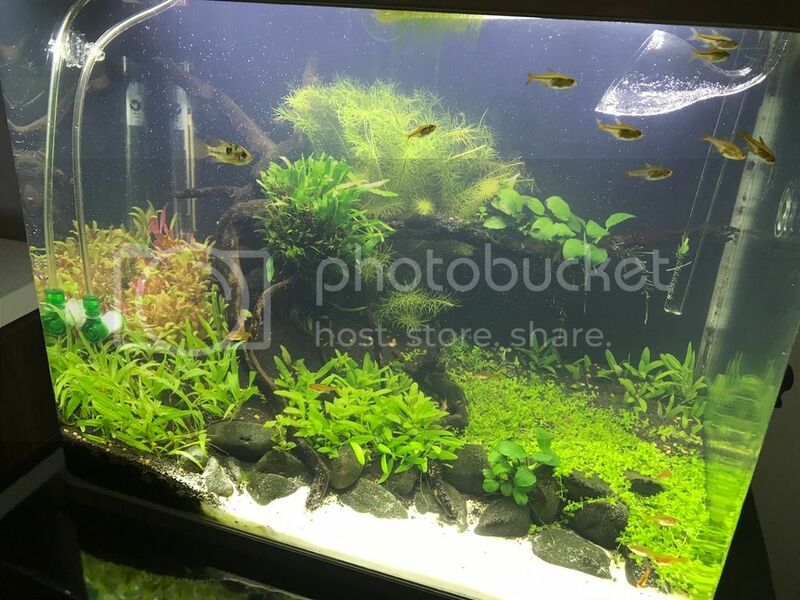 Perhaps some Rasbora maculata https://www.seriouslyfish.com/specie...ras-maculatus/ could be good because they tend to go all over the place but don't school. 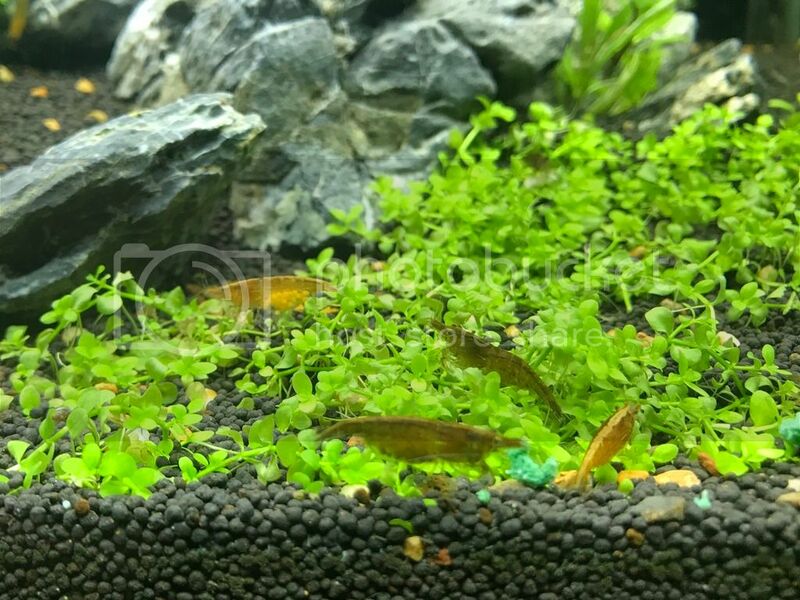 Otherwise male endlers but you need small specimens from breeders rather than the LFS. Agree with Rebel regarding the wood piece in the back, it doesn't really fit in as it sits right now. Rebel, cheers mate! Yeah, that bit of wood was just a small left over piece that I put in last minute. It’s been bugging me the last few days as well! It’s just placed in there so I’m going to take it out. It really doesn’t fit in with the overall look of the scape. Indir, i was waiting for the Apisto call from you! Haha! I’ve actually gone to the dark side in my other 2 tanks and I have African Dwarfs now. P. Subocellatus ‘Matadi’ (female, still waiting for a male!) and P. Pelvicachromis Taeniatus Nigerian red in my big tank. But....was sold a Pulcher for the female, so fingers crossed I’ll find a correct Taeniatus female at some stage. 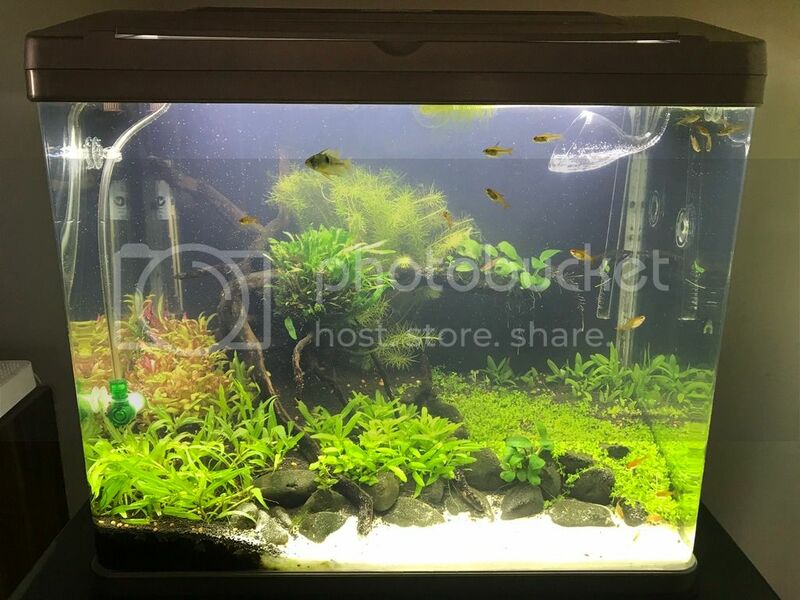 But, chances are not looking good at the moment so I’m thinking of moving them along and getting a pair of some kind of Apisto. Only time will tell what kind. Haha for a moment I thought the wood was a reflection! 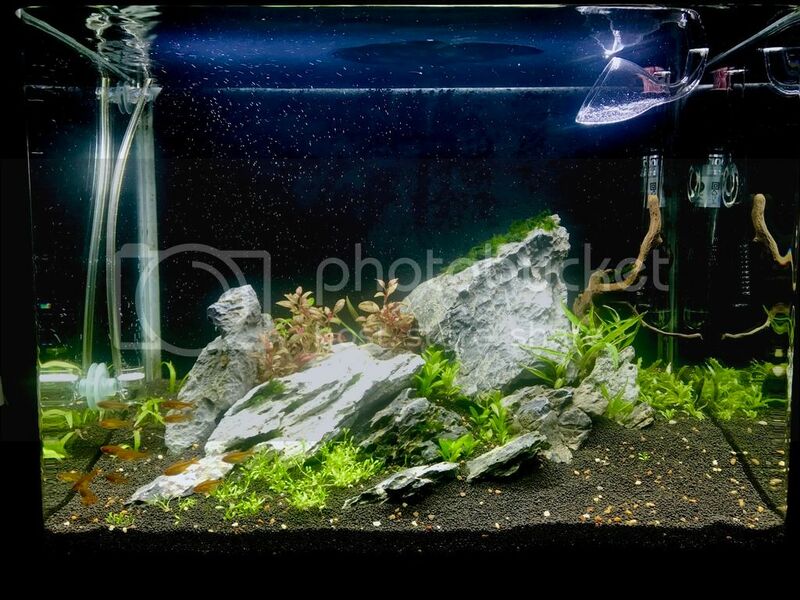 Do you find the light shining on the back of the tank to be adequate? Well I'll keep poking until you bring some apistos back into your tanks or change your username to KribAdam Hahaha. Rebel, yeah mate, the light is good at the back of the tank. I messed around with the pics to make the black backing darker, but in doing that it made the light look like it is right at the front. I’ve taken the wood out, planted the MC, planted some more Pogo in an empty spot at the front left, now I’m dealing with another breakout of BGA. Man that stuff grows fast!! First dose of Easy-life Blue exit was put in this morning. Hahahaha, Indir, KribAdam just doesn’t sound right! 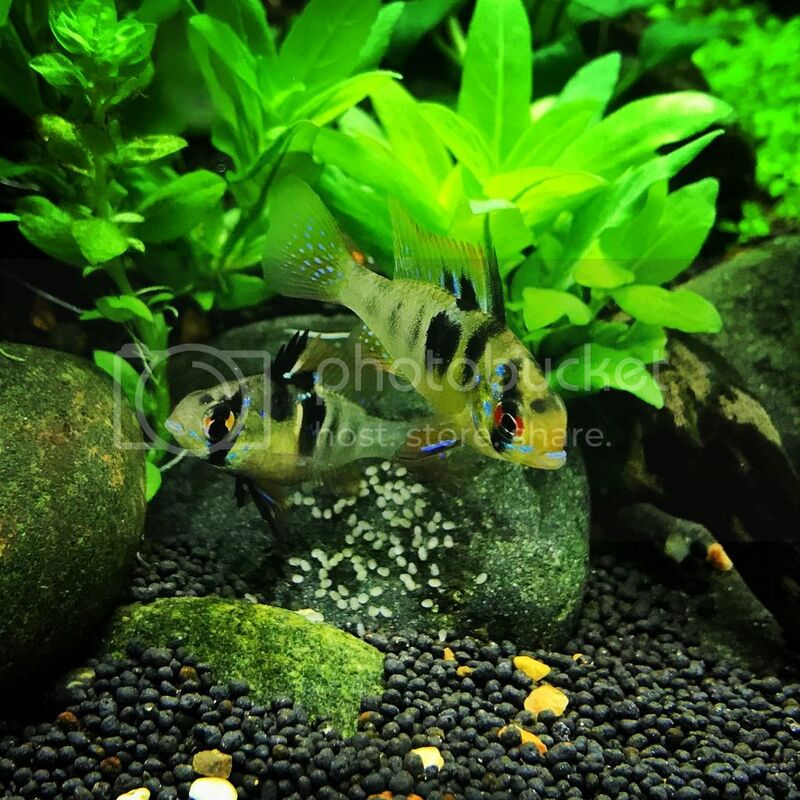 I’ll get more Apistos when you get some Barlowi fry! Tell them to hurry up and spawn already!! Must be something with Barlowi....I know Andrew at Labyrinth had a pair a while back and was struggling to get a spawn from them. Once I find a Male Subo for my girl, I’ll move-on the Taeniatus and put the Subos in my big tank, that will free up a small tank for more Apistos. I hope the barlowi spawned haha. I havent been home a few days this week, so unsure if thats the case. Missus is taking care of them and they are her favourite so she would tell me I hope haha. Just as exciting if not more though Watch my journal post this weekend haha. Would be keen ot see pics of your Subocellatus. The female brooding colouration is quite interesting. Would be keen to see how thye look otherwise. Got the Monte Carlo starting to creep across the front left corner. The Glosso on the right is starting to grow and creep also. Added some Pogo to the front left. The Pogo at the back right had melted and gone, so I’ll get another tissue culture cup and replant that. Added some more Hygro Lancea to the back also. Got the BGA under control with the Blue exit, so that’s a massive relief!! I got some Chocolate Cherry shrimp last Sunday from a guy from gumtree. I already have 4 berried up! I got his culls from him, I’ve never had shrimp before so I didn’t want to go all out with anything special straight away. I’ll work into that after I learn more about them. I added a piece of filter material to the intake pipe, to avoid the Shrimlets from getting sucked into the filter. All in all, I’m pretty happy with how this tank is travelling. 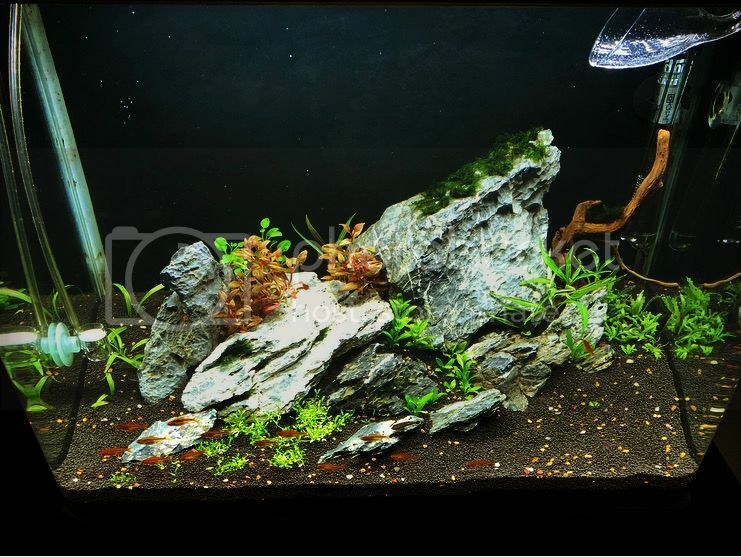 I will be moving the Ember Tetras out soon, and going for Rasbora Maculata, thanks for the suggestion Rebel! Just need a few more plants and some growth and I’ll be getting close to where I want it to be.